Delicious cheddar cheese and many mouth-watering ways of using it in recipes. Ah yes, cheddar cheese… a most versatile and extremely popular cheese. In North America, we use a lot of cheddar. We use it to top off beef burgers and we’re just as happy serving it alongside a warm slice of apple pie. Cheddar cheese is made from cow’s milk. Really good quality cheddar is hard and slightly flaky. If the cheese is rubbery it’s of the poorest quality. Sometimes it may actually have a faint soapy flavor. So always opt for the very best when you can. Mild and medium cheddars should have a mellow taste with little or no aftertaste. Old cheddars (the more mature the better) are tangy and have a definite enjoyable aftertaste. A little goes a long way when you're cooking with more mature cheddar. This cheese also comes in different versions, including wine-infused and other flavorings such as garlic, jalapeno peppers and so on. Try them out and see what you think. Our local farmers' market has a cheese maker and they have an incredible dill cheddar! Like all cheeses, when you're serving it on its own, it's best to serve it at room temperature. What the heck are fricos?! I love these. They’re little edible cups made of melted cheese. You can dress them up for fancy or dress them down for casual. Best of all, they’re easy to make and they're keto friendly! 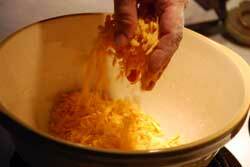 In a bowl, mix the cheese together using your hands. Use a scant 1/4-cup for each frico cup. Bake 2 at a time, mounding the cheese mixture about 6-inches apart. Pat down the mounds a little to flatten slightly. Bake in the middle of the oven for about 10-12 minutes but keep an eye out so they don’t scorch. Take the sheet out and place on a rack to cool for a little less than a minute. With a spatula, transfer the pliable cheese disc to the base of an inverted drinking glass that’s about 2 to 2-1/2 inches in diameter. 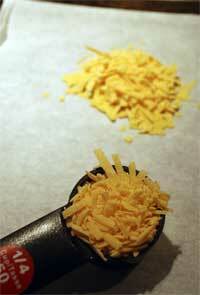 Gently shape the cheese to form a cup. Allow time to cool before transferring to paper towel. Repeat until you have 8 cups. This could actually be served as a light meal by itself with a simple green salad. It’s great served for dinner with pork or beef skewers. 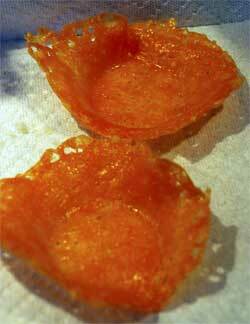 Make the frico cups recipe. Put aside. Combine the first 5 ingredients in a food processor and blend thoroughly. Divide the mayonnaise mixture in half and fill each frico evenly. Top evenly with the black soy beans, green pepper and onions. Finish with a top layer of the remaining mayonnaise mixture. 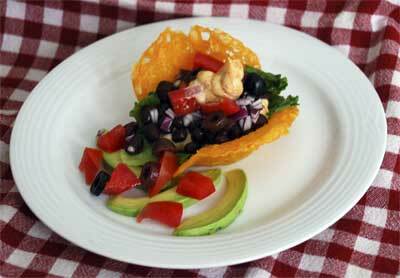 Garnish with chopped tomatoes, olives if using and avocado slices. 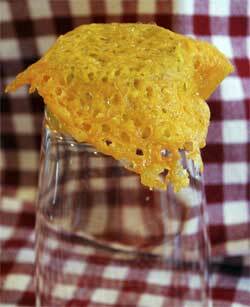 If you'd like more ideas for using cheddar cheese, contact us here.